As easy to use as it is to wear, the HYDE Quickly Clean Glove is your best bet—and the best buy on the market—for tackling your next cleanup job! April showers keep many DIYers indoors working on home maintenance projects large and small, from pepping up interiors with paint to recaulking showers and tubs. Though these home projects can beautify your home, they can also easily coat innocent bystanders—like tools, furniture, windows, floors, counters, or worse, your hands—in residual grime. If your go-to cleanup crew for life’s messes relies on chemical-laden commercial solvents, consider for a moment a safer, more effective natural alternative: the HYDE Quickly Clean Glove. This smart slip-on with a super-strength weave can take oil- or latex-based paint, putty, caulk, dirt, soap scum, and even permanent marker off of any surface without requiring harsh chemicals. Find out how this cleaning companion offers a hands-off solution to spring-cleaning year-round. The magic of this do-it-all glove lies in its simplicity: Just wet it with water, add a squirt of soap (if desired), and then pull on the one-size-fits-all glove to turn your hand into a powerhouse scrubbing agent. 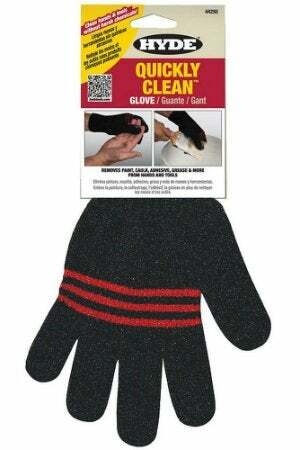 Thanks to the glove’s patented weave, no additional scouring pad is required! Just work your fingers over the dirtied surface. 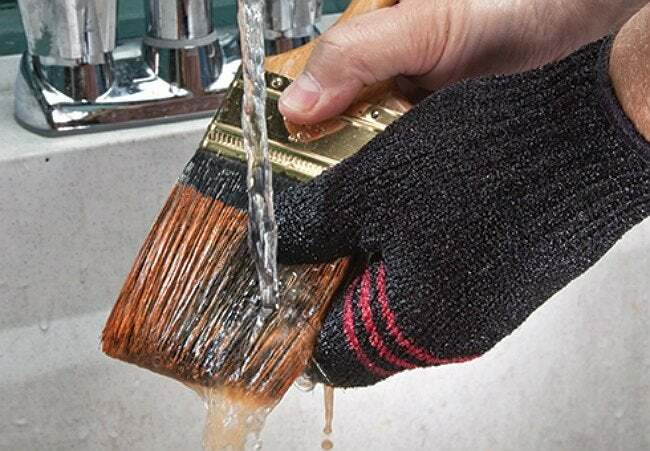 The Quickly Clean Glove acts as an easy-to-control abrasive, so that even gunk on irregular surfaces—like paintbrushes, trowels, and trays as well as your sink, shower, and tub drains—can be wiped away with minimal elbow grease. When your work area is spotless, rinse the handy tool, and hang it to dry until your next job. More than simply saving you physical energy as you tackle your to-do list, the reusable gloves can also save you money at the hardware store. How? By replacing half of your cart. When the glove’s fibers can remove nearly any amount of mess, there’s no need to load up on commercial paint and varnish strippers, foam and caulk removers, and heated sealant and putty removal tools. Leave the budget-busting and cabinet-crowding specialty cleaners behind as you head for checkout with a single top-of-the-line, bottom-dollar Quickly Clean Glove that can be used again and again. Even perfectionist painters will occasionally leave a mark on more than their intended object, often right on their own hands. Should you encounter a similar slip-up, slip on the Quickly Clean Glove and buff your other (uncovered) hand clean without fear of irritating your skin. In fact, the glove is so gentle that it can be used on rugged and sensitive surfaces alike without damaging them. As easy as the Quickly Clean Glove is on you, it’s equally easy on the environment—both indoors and out. Unlike commercial cleaners fraught with chemicals that subject your family to harmful fumes, the Quickly Clean Glove is chemical-free, so you won’t have to pop open a window or wear an air mask. Experienced and amateur painters, mechanics, and hobbyists alike can take comfort in this jack-of-all-trades glove. Good for tidying up tools, furniture, and interior surfaces after paint, caulk, and putty jobs, its versatility practically surpasses your long to-do list. And it doesn’t stop there! The Quickly Clean Glove can also be used in the kitchen to wipe up the refrigerator—and even the produce within it—clean. Headed outdoors? Use the glove on siding and outdoor furniture to get rid of algae, in the garage to clear tar from auto parts, or at the golf course to remove grass from your 5-iron. And given the Quickly Clean Glove’s bargain price, you can afford to keep a pair with every cleaning caddy you have, indoors, outdoors, and beyond! Watch the video below to see the HYDE Quickly Clean Glove in action!